Finally we set off north out of Los Angeles. Maps were eschewed in favour of the new toy – the GPS. 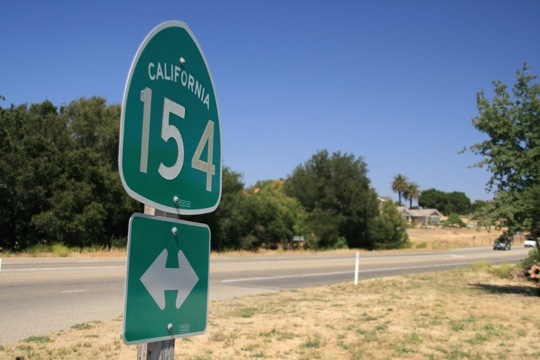 We set our destination, and were guided by a soothing voice to our first port of call – Carpinteria State Beach Campground. So easy! Out the window with squabbles over directions! This machine could save so many relationships. We scored the last spot in the campsite, a site big enough for about 10 two-man tents like ours. Camping in the part of the world is about RVs, pickup trucks and huge family BBQs. RVs, or recreational vehicles, are something like the monstrosity driven by the Focker family in “Meet the Fockers”. The more engines the better – RVs tow cars, jetskis, sandbuggies and scooters, so that when the RV is parked at the camp there is a myriad of other motorised transport. Petrol costs haven’t scared them away yet! We used this camp as a base to explore Santa Barbara, 12 miles north. SB is a postcard-pretty place. 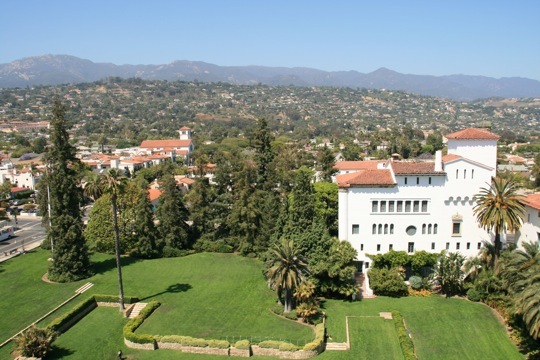 After a devastating earthquake in 1925, laws were passed requiring all buildings to be rebuilt Spanish style, all adobe facades and terracotta tiles. The town is perfect, not a hair out of place. We arrived into a farmer’s market, bursting with fresh fruit and sunny Californian complexions. Coffee at Java Jones proved strong, and we enjoyed several hours exploring State St shops and buildings. 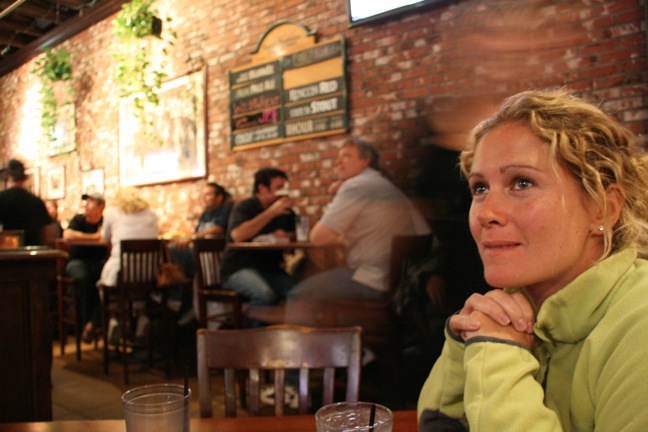 One of the playoff basketball games between Boston Celtics and the LA Lakers was on that night, so we joined in and cheered at the microbrewery. On our tour the next day, we skipped the Museum of Art and concentrated instead on the County Court House and the Mission building. The Court House is a beautiful Adobe-facade structure, built in Spanish-Moorish Revival style. A kindly retired school teacher took us around on a tour. We managed to mooch around Santa Barbara for a couple of days, enjoying the sunshine. While there, we met hoards of Irish students, freshly arrived off the plane for the summer. The J1 is still alive – though I think it is more lifestyle focussed than concentrated on getting a job! 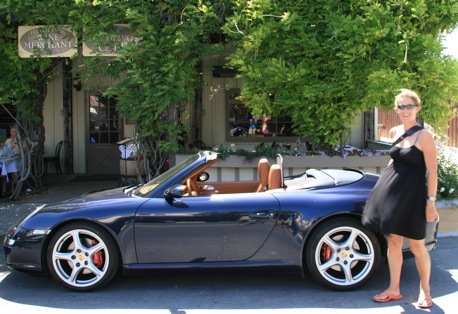 We couldn’t leave Santa Barbara without a trip through the winelands. 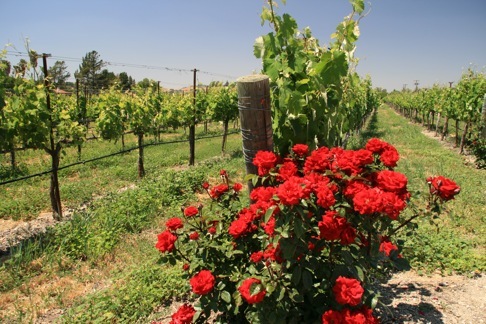 Though not as well known as its cousins Sonoma and Napa Valley to the north, it is a very pretty area. It was also immortalised in the film Sideways, the story of two men on a bachelor holiday who have a love for good Pinot Noir! 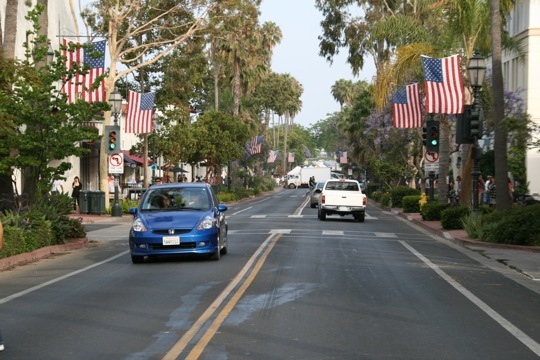 We visited the town of Los Olivos, where Miles & Jack ate at Los Olivos Restaurant, and enjoyed a glass of wine there. 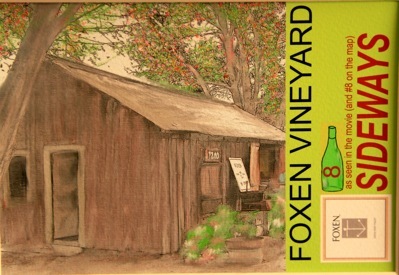 We visited Foxen Vineyard, a small operation on the beautiful Foxen Canyon road. 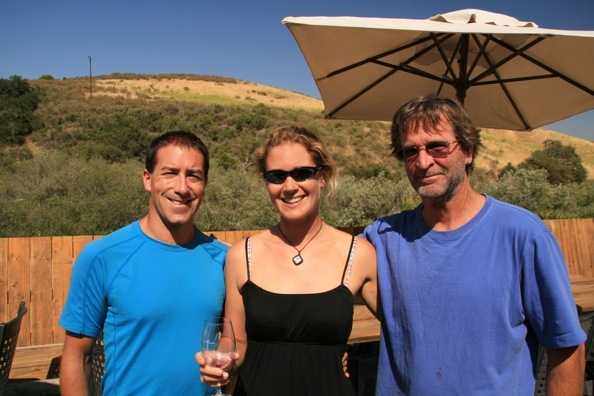 We got chatting to the very amiable owner, who very kindly gave us a bottle of his white Viognier wine! This bottle came in very useful while camping a few nights later – we had no food, so the offer of a glass of wine was enough to get two friendly Americans to share their roast chicken! Hi Jane and Cathal. Good to see you in a more civilized world, was very close to packing a bag and setting off to follow in your footsteps across South America, almost managed to convince a friend of mine to join me, I think if she was keen I would seriously have been tempted. Although now reading of your next adventure it brings back many great memories, Santa Barbara, Big Sur, Hollywood etc. And the sun and blue skies – hopefully it will be a decent summer here in Ireland. Take care and keep the pictures and stories rolling.